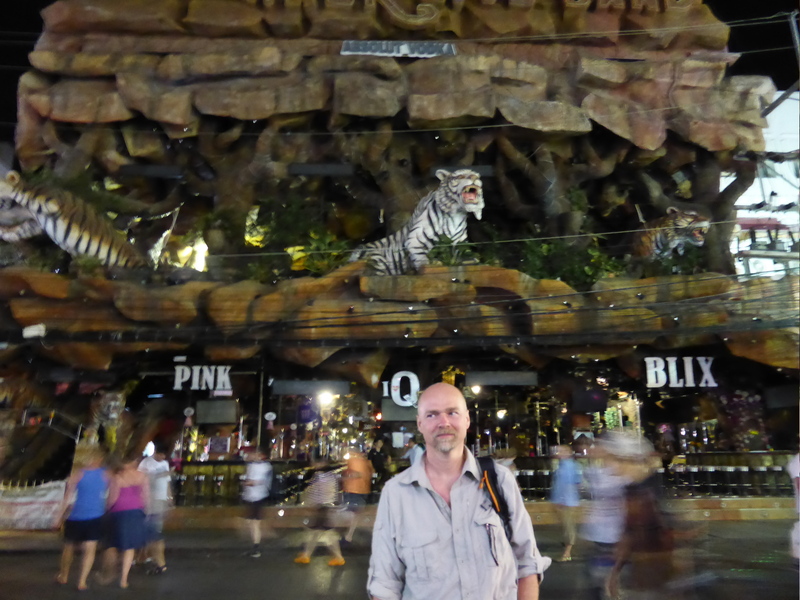 Day 7 ( Friday, 31/01/14) – Our 2 weeks back packing adventure continued, now to the South of Thailand on the Andaman Sea. We flew from Chiang Mai to the large Island of Phuket. From the Airport in Phuket we took a mini-bus to Patong Beach, arriving at our hotel tired and hungry at about 4 pm. Also annoyed with the mini bus driver, for stopping randomly at a place were they were clearly keen to sell excursions etc. to all of us, when all we wanted was to be taken to our hotels with no hassle. But in Thailand you have to learn that this kind of thing is not unusual and entrepreneurial schemes designed to get you parted with your hard earned cash is a common theme and perhaps something we should just accept and go along with it, without stressing out, after all we all need to earn a living. Looking back I think it was just bad timing, we were not in the mood to buy anything at that point. First impressions of our hotel were not overly positive, we did not like it that much, but it was very central, in a busy road in the middle of bustling Patong. Although a central location, it did not have the same friendly service and charm of our previous hotel’s at Bangkok and Chiang Mai. It looked clean and comfortable though, even though it was a very noisy place. We made good use of our ear plugs here. 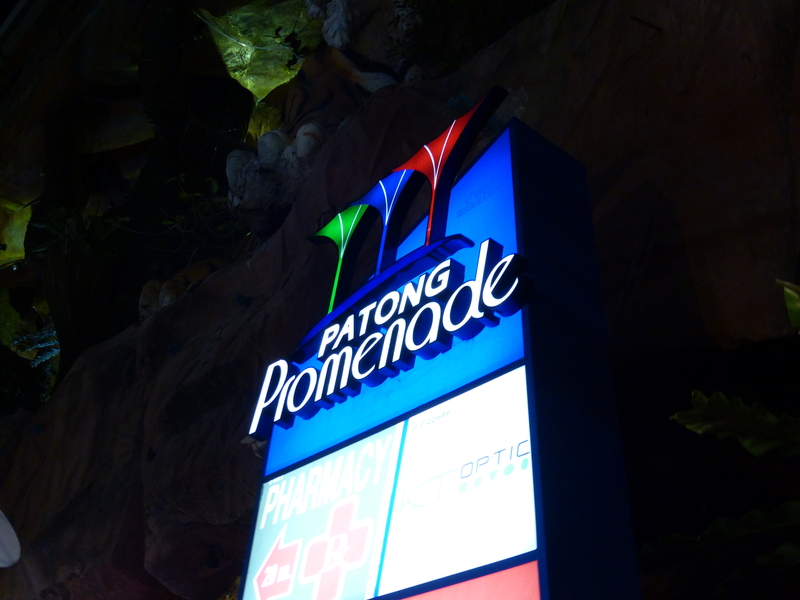 In fact initial impressions of Patong were not that great either, there was a huge amount of construction going on and the whole place seemed charmless, hectic, commercialised and in places pretty seedy, which I am sure is a part of the attraction for some of the visitors. Patong Beach, on Phuket’s west coast, is the main tourist resort and centre of Phuket’s night life. It is great for people looking for a good time, in a tropical white, sandy beach and a beautiful bay, bathed by turquoise waters. It is a tourist Mecca, with a free for all attitude and a mid-life crisis on steroids for many. Numerous hotels, bars, restaurants, clubs, seedy go go bars and discotheques line the beach front and the popular Bangla Road. See below the new Tiger Disco on Bangla Road, which opened in 2013, after the previous Tiger Disco, situated on the other side of the road had burned down at the end of 2012. You just can’t miss this imposing complex, with large concrete tigers at the entrance front. The Patong of 30 years ago, was a small fishing village and it is not difficult to imagine why it has became so popular, and like many other beautiful beaches in Thailand has fallen foul of its own beauty. Too beautiful for its own good? Although we found it fascinating to people watch and we enjoyed the lively vibe, it was perhaps too bold, bright, crowded, loud and brash for us (senior citizen’s) and maybe our own mid-life crisis has already been to some extent resolved and moved on and we felt that it was not for us (we are not really big party people). It is a place that you either love it or hate it, but for us, although we can’t say that we hated it, all the things that has made it so popular to others, has made it unappealing to us. It is bustling and lively, like Bangkok, but it does not have the charm and culture of Bangkok (although I am not talking about Phuket Island here, but only Patong, as we did not have enough time to explore more of the Phuket Island and all that has to offer and therefore comparisons would be unfair). 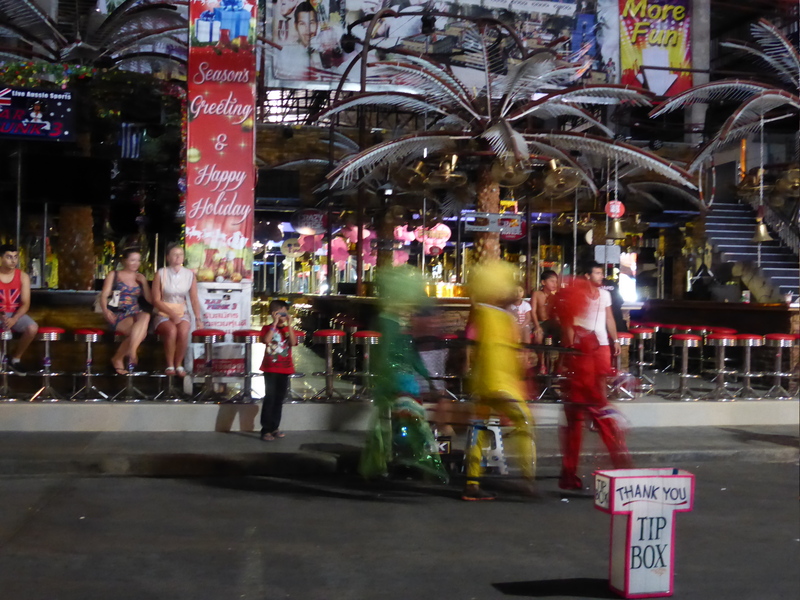 The night life in Patong is set around Soi Bangla and Rat U Thit Road and the Paradise Complex, with its popular gay scene at the foot of the Royal Paradise Hotel Tower, where you can catch live cabaret shows with the popular and beautiful lady-boys. In any case we decided to enjoy our 2 days in this crazy place and we did find a lovely place to eat and later on moved on for a drink at a lively bar, where Brian managed to organize the rest of our trip. He booked a flight for us from Phuket to Bangkok, for when we come back here in a few days time, after Phi Phi Island. Originally we thought we could take a ferry boat to Krabi and take the route of bus (4 hours) and train (12 hours) to Bangkok, but since our time was so limited we decided that flying would be the best option. Time and time again it proved invaluable to have the local sim card which Brian had bought in Bangkok allowing us to access the internet on his phone from anywhere we went, researching and booking ahead as we went. Souvenirs, T-shirts, Taylor’s ( that can make you a suit in just few hours), night markets (specialized in fake goods), DVD’s, Thai massage places (naughty massages with the “happy ending” ), foot massage stalls with just lay back chairs at the side of a road, art galleries with some very interesting paintings and drawings. 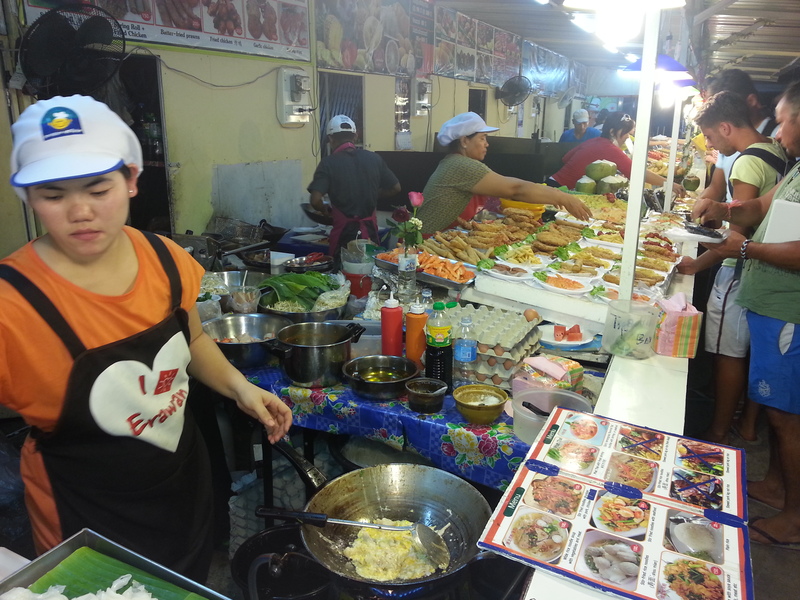 We did not find any very authentic Thai food restaurants, although you can find food from all over the world here, it was difficult to find the lovely street food we found in Bangkok or the charming little local restaurants we found in Chiang Mai and later on at Phi Phi Island. But possibly we did not look on the right places? There are Food Courts, which are popular, you can order food from one of the many stalls set around an area with tables in the middle. Again a very lively place with music and constant bustle of people getting a cheaper bite to eat outdoors. The food is cooked in a hot wok pan in front of you,as the smell and sizzling noises of the spicy ingredients are mixed together, it awakes your taste buds and makes your mouth water with anticipation. Patong Beach, like many other beaches along that coast line of Phuket, was badly affected by the 2004 Tsunami, and a lot of the beach front and immediately in-land areas were destroyed and many people were killed. It has since then recovered and started thriving again. Along the beach front there are memorial’s set up for the victims of this awful natural disaster,a reminder for all that come here to visit that even paradise can quickly turn into hell. Since Patong Beach was a little bit too crowded for us we decided that on our second day in Phuket we would explore a quieter beach and so we took a tuk tuk ( a 4 wheel one), to Hat Kamala, just North of Patong. We paid far too much for this very short ride, since we failed to negotiate a better price and also made the mistake of thinking that it was 500 baht just one way, when it was actually a return price and we did not realise it until it was too late, after we paid him 500 baht to go and another 500 baht to return. I think Brian got dazzled by the lovely Miau,a Thai girl who sorted out our tickets to Ko Phi Phi, and so when she suggested we get into her “uncle’s” tuk tuk for 500 baht to Kamala, Brian who is usually an expert haggler, suddenly let his guard down and totally trusted her. But can’t really blame him, since Miau was very pretty and charming. Kamala Beach was lovely, with clear turquoise water and a serene bay which was not too crowded and so we hired a couple of beach chairs on the white sand, and lazed down there all day long, just relaxing, eating Pad noodles and chicken satay and drinking fruit shakes, from the nearby restaurant. We did do a short walk around, further along the beach, to stretch our legs and eat a delicious banana pancake and drank some more delicious fruit shakes. In fact the fruit shakes are just amazing and refreshing (and so cheap). 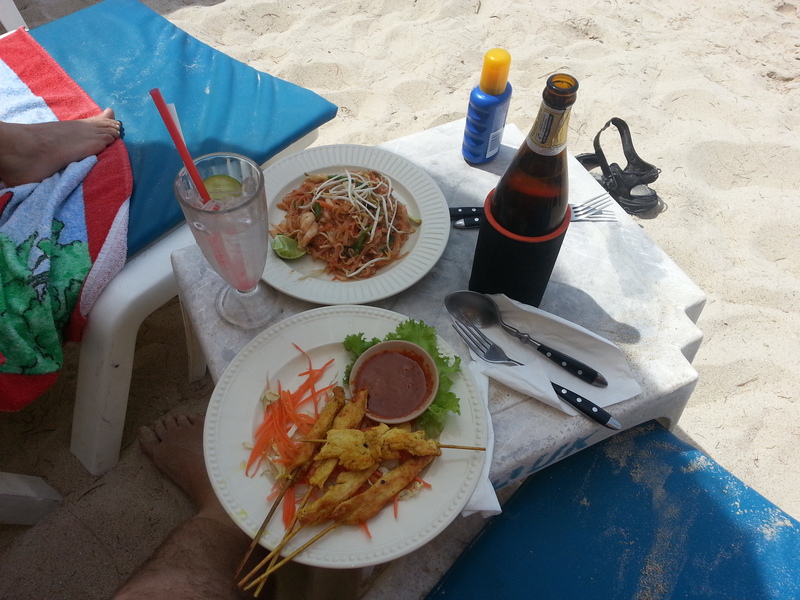 We left at around 5 ish, and went back to Patong Beach to have our dinner. We were surprised to find that many bars were closed, because tomorrow it was going to be election day in Thailand and closing down the bars meant more sober people voting for the right candidate. Later on we heard on the news that there has been some more riots in Bangkok and that there was violence and some people died in the demonstrations. Something difficult to comprehend in the land of smiles. And so our adventure continued, tomorrow we would be catching a ferry boat to Ko Phi Phi, full of excitement for what the next leg of our journey would bring we went back to our hotel to pack our bags and have a good night sleep (ear plugs in place), we were already looking forward to exploring a new place, and had sorted out transport to get us to the ferry. I very comprehensive and candid account of Phuket. I had the pleasure of visiting Phuket in 1985 when it was still paradise. Sadly nothing stays the same but your inspiring narratives of other parts of Thailand have made me want to go back again, though I will leave Phuket out this time. So looking forward to the next one. Please keep them coming…. Thank you for your comment my dear friend. Phuket is such a large Island and it has many beautiful beaches, I am sure you must have loved it there back in 1985. 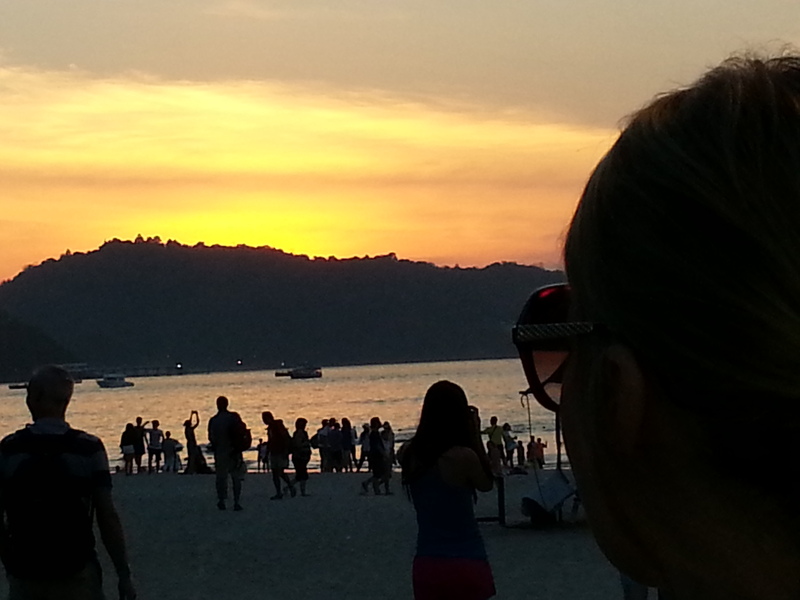 But unfortunately Patong beach was not the one for us. I would go back to Phuket though and explore more. Adorei a viagem de vcs e fiquei imaginando se um dia eu vou poder ir a tailandia conferir todas estas maravilhas q vc relatou… morri de rir q a thai girl passou a perna no Brian direitinho… kkkkk… nao dá pra ganhar todas as vezes não é? Sister querida, com certeza um dia vai ser voce indo conhecer esse pais incrivel e eu vou poder te dar varias dicas. O Brian caiu direitinho no charme da Miau e pagou o preco. Tambem dei boas rizadas dele.